It’s like the first thought that will influence pretty much every decision you make. From what to wear to the car that you choose to drive. Colour impacts us in so many ways, but mostly in how we shape our lives. So this colour mood board is here to illustrate that. Colour can make a huge impact on our mood – which is why decorators and stylists take colour seriously when using colour in décor and other spaces we spend lots of time daily. In fact, this colour is often use in work spaces because it stimulates the mind! Choosing a colour for your home will have to be just as strategic. Designer Tiffany Pratt says that colour affects each of us differently. So ask yourself how you feel when you look at art, magazines, photos or anything that gives you an emotional reaction. Also take note of colour cues. What colour is your notebook? Peruse your Pinterest pins and look for common colour themes. Your closet can be a good resource, too. This popular colour theme is sooooo calming. The above colour mood board is about colour options. I’ve created the theme around the Julian Collection and its colour options (left to right): Teal, blue, beige and grey. I created the colour mood board to show the variety of options, instead of picking one colour (not that there’s anything wrong with that!). I did this to give me a sense of the feel each colour brings, as well as complementary colours and possible décor themes, like nautical. And this process could lead into other mood boards, too! The possibilities – er, rather, the inspiration, is endless. 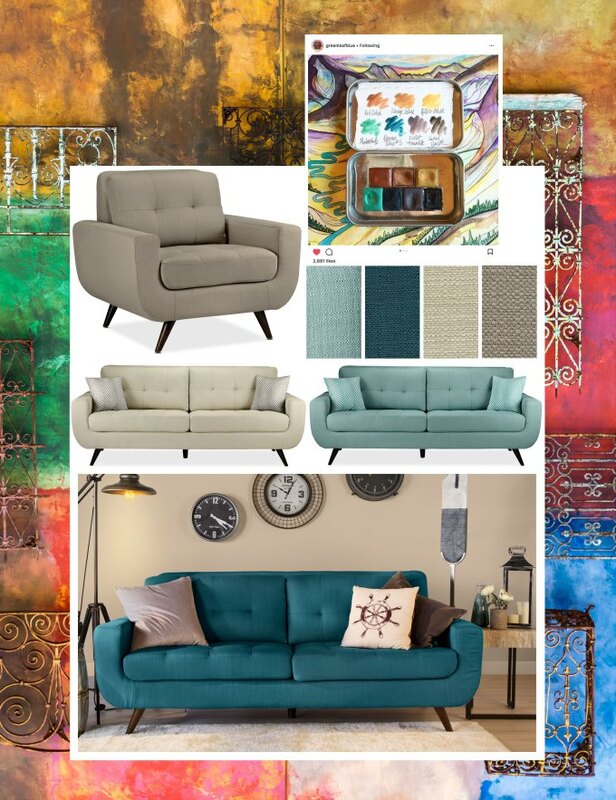 Here are some other colour mood boards you should check out too. It’s Time To Lighten Up!